Since reading Sherrill Sellman's book Hormone Heresy: What women must know about their hormones I've decided that I have to find a natural alternative to Hormone Replacement Therapy. I'm already not keen on medication, and the idea of pumping my body with a cocktail of synthetic hormones yet again (since I stopped the Pill) does not appeal. He prescribed estriol (a form of oestrogen) for down below, and, to his credit, instead of imposing HRT on me, suggested I ask my buddies about HRT, and to do some research on the internet. So I did. Well I did the internet bit because I don't have many friends who have hit menopause yet. I discovered that HRT is not all it's made out to be, and that some women have disastrous reactions to it. Instead of taking it and risk becoming oestrogen dominant which is not a good thing, I wanted to balance out the hormonal imbalance between oestrogen and progesterone in my menopausal body as naturally and side-effect-free as possible. Dr Sellman suggests seeing a naturopathic doctor, and as luck would have it, the Pages Jaunes for Montpellier threw up two: a man and a woman. I looked at the woman's web page and noted she has 25 years of experience, and, from her photo saw that she has very probably gone through menopause. It seemed an obvious choice to select her rather than the man who did not have a web site and thus was just a name on a page. Today was the day when I had my appointment. I took along my blood test analyses (usual stuff plus FSH which determines whether you're in menopause or not because it's a reproductive hormone - I am) and found myself in a little outhouse in the doc's garden. She started by looking at my eyes. Apparently you can tell a lot from eyes. Before she looked at my blood tests, she flashed a torch at me and asked me whether I had some intestinal issues, and some joint problems, and said I have an excellent 'hygiene de vie' which means I'm in roaring good health. I was pleased to hear that because I have made a lot of effort in the past year, and it's obviously paid off, not that I was abusing my health before, but I'm taking more care now (organic fruit and veg, less meat, dairy and bread, sport). Rhadiola Rosea and Magnesium Marin to improve the quality of my sleep and help me relax. I was in there for an hour and it cost me 65 Eur which should be reimbursed by my mutuelle. I have to get most of the supplements on the internet, and she indicated where I could go because there's such a variety out there. I'll be chucking out the estriol which had revolting consequences. In the same vein, I started doing a local yoga course this evening. It was a trial session, and although there was some noise from the other activities going on in the communal centre, I found it relaxing and pretty promising. Got to keep my strength up for all this healthy living! The other thing about HRT is that you really don't want to be pumping oestrogen into your body, when 1 in 10 women (or whatever the figure is) will develop breast cancer in their lives. Breast cancer medication is all about removing or reducing oestrogen, because it feeds the cancer. I like the sound of your naturopath, and your approach. We can't be young forever, and surely some of the journey is allowing our minds and souls to catch up with the fact that our bodies are ageing. Thanks, Iota. The naturopathe looks terrific. She's 63 but certainly doesn't look it. These days we have to combat the toxic effects of our environment and food on our bodies that didn't exist in the past. Houblon? That means beer. Menopause, I'm ready. Interesting. I have been taking HRT for a while since having early onset menopause. It's been great for me and I was happy to take them as, from my own research, felt it was replacing what would normally be present before the menopause. The decision regarding when to come off them is now arising - for me the risks up to now have been worth taking but carrying on with HRT past the normal age for menopause is something I don't want to do. Absolutely, I read that it's not a good idea to take it long term. I'm glad you've been satisfied with it, no doubt you would have stopped it if you hadn't been! We are not told about hormone imbalances enough (at all) and yet they have a major effect on our health and sense of well-being! 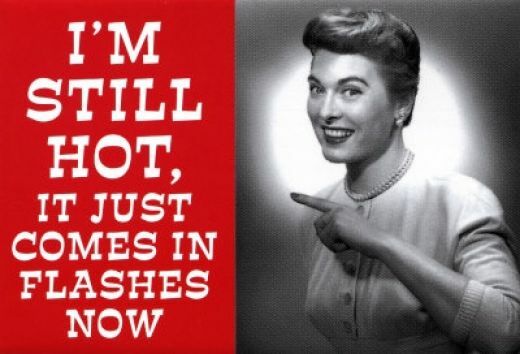 I'll say this, with respect to hot flashes.....my late grandmother suffered from far too many. Poor lady. It sounds like you have a very competent doctor. Do listen to her advice. I'm so glad I've seen this post (I'm so far behind on everyone's posts!) because you have just described me! The flushes which I've been coping with quite well are now so out of hand it's not true! I look forward to seeing how you get on with all those recommended supplements. It's a fascinating subject. You must have enjoyed studying it, and I'm sure you put it all to good use! I'll look out for Kenton's books.